&H4D&H5A&H90&H00&H03&H00&H00&H00&H04&H00&H00&H00... in the main document body, which is then decoded to binary, and written out to an exe file in the %USERPROFILE% directory. 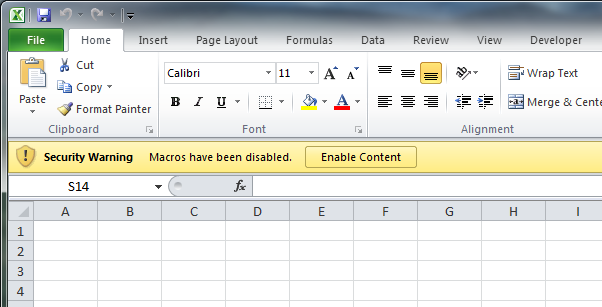 The macro then starts the executable with the Shell function. This approach has some advantages, such as that the shell will not die when the program is closed, but it not ideal for a number of reasons. Dropping and starting an executable is a big chance to trigger AV, create a suspicious file and process, and possibly leave more logs to clean up. This code requires a large block of suspicious text be placed in the body of the document, where it might be noticed by the user. Oh well, anyway, now it will soon be is available to all of Metasploit world. Here's an example of a simple generated .xls calc.xls. This entry was posted on January 22, 2012, 12:09 pm and is filed under Exploits, Metasploit. You can follow any responses to this entry through RSS 2.0. Both comments and pings are currently closed. then it should work in both versions. But I don’t have a 64 bit office to test. :-/ Otherwise it’s just break out the windbg and see what happens. Hi , thanks for this awesome share . However any idea how to encrypt or use custom exe with this method? It gets AV detection upon enabling macros . Well, the point of the article was how to not use an exe; only shellcode and/or macro code. You could try obfuscating the shellcode by different techniques, e.g. encrypting it and then decrypting with the macro before running it. AV might also be detecting which functions you are using to start the shellcode. The ones I used are just an example, you could use any of the other windows API functions such as the HeapCreate/HeapAlloc pair or VirtualProtect, or even things like ROP techniques to start your code. The main idea of AV evasion is to do something different. If I post a specific recipe here, the AV companies will just signature that, so you’ll have to figure out the last mile yourself. Thanks for your reply , I am looking into the various obfuscation methods . Thanks for the nice post, what about application whitelisting products, If the xls is whitelisted does this get detected ? Regarding the working concept of Metasploit, after the victim been social engineered (has received a malcious file/ link, etc) and opened the file/clicked the link, does the exploit involves dropping an executable in the hard disk, creating a new process, or just run a shell code on the victime machine, my concern here is that does whitelisting can detect Metapsloit exploit or no ? The file does not drop an executable on disk or DLL or script; I am unaware of any application whitelisting products which will stop this. If you use it without modification, some antiviruses will pick it up, but they can be bypassed with a little obfuscation. They do the following (see below) to initialize (i think) a ‘virtual’ com / class, and it resembles quite a bit what you explains, am i right? That said, i still cannot find any information whatsoever on writing my own virtual com classes/objects. It would ‘increase’ the security of my projects quite a bit if i could do what everythingaccess does to protect their program. Do you have any useful links to info for me? Hello. Realize I’m a bit tardy to these comments but as part of a side project I’ve recently started to work on–getting PowerShell code from an Empire stager or agent to initially run inside an Office process itself instead of spawning a new (easily detectable) scripting process like powershell.exe –I’ve just come across your work and that of Didier Stevens. It’s been tremendously helpful in leading me to look at a relatively easy conceptual way that that might be accomplished. (As opposed to trying to learn vba, which I personally have very little familiarity with, well enough to try to accomplish a RefelectivePick-type implementation in that language similar to what others in the pen test community have done in C++ and C#/.NET.) However, when it comes to actual code I’ve hit a snag: neither the calc.xls sample provided above nor code produced by the -f vba output in Metasploit is actually working for me in Office 2013 (x64). Like I said, I’m not tremendously familiar with working in vba, but my non-expert efforts trying to trace down exactly what the editor thinks is wrongly appearing “after End Sub, End Function, or End Property” have been frustrated. There’s no obvious part in the code that stands out to me that that could apply to. Most perplexing is that the editor is highlighting the very first line of the substantive code (“Private Declare PtrSafe Function CreateThread” etc.). And even deleting that line for the sake of troubleshooting (or various other lines experimentally) still results in the same error occurring. BTW, my overall approach right now is to take Empire’s reflective dll stager and get it loaded staying within WINWORD by running the vba ouput shellcode from a windows/dllinject Metasploit payload module in the macro. At this stage I’m just trying to see if I can be lazy and get proof-of-concept method working without having to really learn vba and do a ton of work in it to basically recreate what you and Stephens already figured out. Things like getting the code to work across 2010/2013/2016 on x86 and x64, looking at basic av evasion, getting a PowerShell agent running in the Office process to inject somewhere else before the user closes the application, etc. are things I intend to address after I get something working first off. Does that work for you? Maybe try modifying that step by step until you figure out what’s not working. If you do get it working, you should post a sample.